Sanford Bishop Jr. was born on February 4, 1947 in Mobile, Alabama. After earning a BA in political science from Morehouse College in 1968 and a JD from Emory University in 1971, he worked as a partner in two private law firms between 1972 and 1992. Bishop also served as a Democrat in the Georgia State House of Representatives from 1977-90, and in the Georgia State Senate from 1991-92. 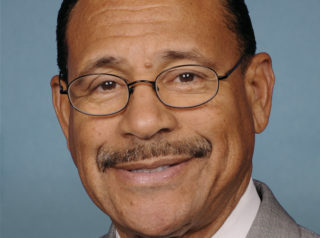 Since 1993 he has held Georgia’s 2nd Congressional District seat in the U.S. House of Representatives, where he is a member of the Congressional Black Caucus (CBC). He is also a member of the NAACP. At a September 2010 luncheon in Dougherty County, Georgia, Bishop stated that “politics is all about who gets what, when and how.” “I am fortunate and blessed,” he added, “to have learned over the past 18 years and have come to be in a position to make things happen for the people of the 2nd District of Georgia.” That same month, it was reported that during 2003-05 Bishop had given his stepdaughter and his wife’s niece thousands of dollars from a Congressional Black Caucus Foundation (CBCF) program that annually provides each CBC member with $10,000 that is to be awarded, in the form of scholarships, to deserving students in the member’s district. During that two-year period, Bishop’s wife chaired a committee of lawmaker spouses who raised money for the program. When news of Rep. Bishop’s actions became public in 2010, the congressman—aware that CBC members were explicitly forbidden from giving any scholarship funds to their own relatives, or to the relatives of their aides or friends—immediately announced that he would reimburse the CBCF a total of $6,350. He refused to admit any legal wrongdoing, however, explaining—falsely—that the restrictions had not been put in place until 2008. Later in September 2010, it was learned that in the early 2000s Bishop had also given CBCF scholarship money to the children of several individuals with close professional ties to the congressman and his wife. Those additional recipients included Sherletha Thomas, who worked for Mrs. Bishop and later married a staffer of the congressman; Bonica Smith, the daughter of a deputy to Mrs. Bishop; Kelli Blair, the daughter of Mrs. Bishop’s deputy court clerk; and Tiffany Tisdale, the niece of one of Rep. Bishop’s staffers. Another beneficiary, Jonathan Alston, was a former campaign volunteer for Rep. Bishop and did not even live in the congressman’a district when he was awarded his scholarship. Highly concerned about immigration-related issues, Rep. Bishop avidly supports the DREAM Act—legislation designed to create a path-to-citizenship for illegal aliens who came to the United States as minors. Bishop likewise backed the Obama Administration’s controversial “Deferred Action for Childhood Arrivals” (DACA) program, initiated in June 2012 to guarantee that most DREAM Act-eligible illegals would be granted legal status and work permits for two years. Many of them would also be eligible for benefits under the Earned Income Tax Credit and the Additional Child Tax Credit—and perhaps government assistance in covering such expenses as healthcare, housing, food, education, child care, and job training. In 2014 Bishop voted against H.R. 5272, a bill aiming to restrict the DACA program. When the Daily Caller in February 2018 contacted Bishop and a number of his fellow Congressional Black Caucus members to ask if they would be willing to publicly denounce the notorious Nation of Islam leader Louis Farrakhan, Bishop was one of 20 who declined not only to denounce him, but also to issue any comment at all regarding his infamous anti-Semitic, anti-white rhetoric. For an overview of Bishop’s voting record on a wide array of additional issues, click here. For additional information on Sanford Bishop, click here. Further Reading: “Sanford Bishop” (Votesmart.org); “The ‘Bringing Home the Bacon’ Campaigner” (National Review, 9-24-2010); “Oh Look, Another CBC Member Steering Scholarship Money to Relatives” (National Review, 9-10-2010); “More Charity Scholarships Went to Students Tied to South Georgia Lawmaker, His Wife” (Fox News, 9-24-2010); “Pigford: The Unexamined Obama Administration Scandal” (American Thinker, 6-15-2013); “Congressman Sanford Bishop, His Scandal and the Pigford Cover-Up” (by Lee Stranahan, 1-13-2012); “Black Caucus Members Refuse to Denounce Hate Group Leader Louis Farrakhan” (Daily Caller, 2-7-2018).